Some people would give anything to spend their vacation days at an endless garage sale. There are numerous opportunities to do just that, with a host of “longest” garage sales linking cities and towns across the U.S. The common denominator? Often a stretch of highway that passes through them. Peaches to the Beaches Yard Sale is billed as Georgia’s largest yard sale, and the event, which is also known as Explore Highway 341, always takes place the second Friday and Saturday in March. Paula Anderson, secretary-treasurer of the Telfair County Chamber of Commerce, said, “Peaches to the Beaches Yard Sale is owned by Golden Isles Parkway Association Inc. 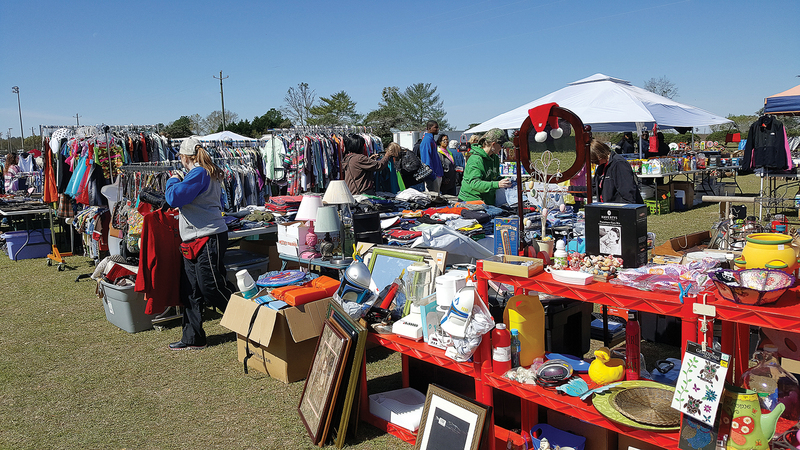 The 2018 event was the 14th year of the yard sale, which is held along Highway 341 in the following counties: Lamar County, Crawford County, Peach County, Houston County, Pulaski County, Dodge County, Telfair County, Jeff Davis County, Appling County, Wayne County and Glynn County. 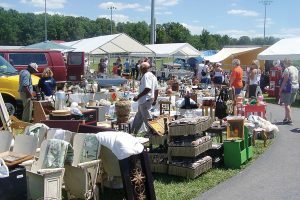 Georgia’s longest yard sale has proven to be a boon not only for the vendors, but also for the cities as a very popular tourism event. “Who would have thought that a 220-plus mile yard sale could have such a positive impact on the economies of 11 counties?” marveled Anderson. As Anderson mentioned previously, there are 11 counties/cities that this yard sale runs through, so each county/city may handle its community differently in terms of law enforcement during that weekend to make sure travel is safe for everyone. Have any cities chosen to really get behind this and promote it? Also, said Anderson, there is a partnership between the counties/cities along this route through GIPA. She noted that if a city/county had an ordinance about yard sales, it was typically waived for this event. 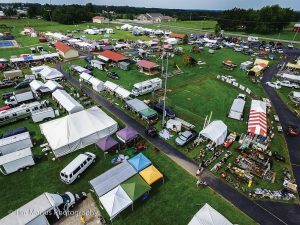 Jamestown, Tenn., is in Fentress County where the Fentress County Chamber of Commerce serves as the headquarters for the World’s Longest Yard Sale, or the US 127 Corridor Sale, said Misty Stephens, tourism and membership director. “We work with our county and city officials to ensure that people are safe during the event. Due to the influx of travelers along Highway 127, we work with local county and city workers to post signage along the highway to help motorists on their travels. Some cities do have ordinances in place, said Stephens, and they do ask that vendors and shoppers respect and comply by the rules of the area they are visiting. Does each city on the route promote the event? What about cities partnering together along the route? “Since the yard sale is almost 700 miles, cities tend to ‘do their own thing.’ Each city has its own rules and regulations and we ask folks attending the sale to be respectful as to what those cities may be asking or might require,” Stephens said. These sales can offer literally anything and everything under the sun. 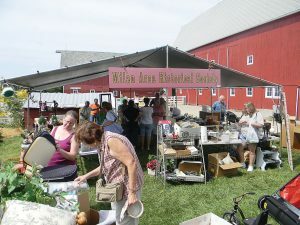 Buy lawn mowers, dishes, fresh garden produce, antiquities, live entertainment, harnesses and tack and so much more. The settings are equally as varied and include homes, parking lots, businesses and farms, all along the designated highway. A plethora of sales can be found on www.thebalance.com/the-longest-yard-sales-in-the-u-s-1389261 website, which lists longest sales throughout the country. Linda Curtis of Grimes, Iowa, is president of the Iowa Highway 141 Garage Sale and described what she liked most about the sale. Kristopher Martin, associate planner of Southwest Michigan Planning Commission and project coordinator of US 12 Heritage Trail, is already preparing for his state’s longest sale, which will run Aug. 10-12, 2018 and covers 180 miles. “This is a very large route and passes through eight different counties, several cities, townships and villages,” said Martin. According to Martin, his planning commission sends the cities a packet each year with flyers, press releases and posters on information about the sale to cities, visitor centers and chambers of commerce. This gives them time to pass this information to their residents, visitors or members. Martin said he was not aware of any special rules or ordinances in place for resident garage sale participants. As for cities along the route partnering together to promote this popular sale-a-bration, they have done so since the early 2000s when they formed a committee to push for the designation of the US 12 Heritage Route. They had members representing communities/cities along the route and would meet regularly. Sadly, the funding for such efforts doesn’t currently exist, said Martin. Having community-wide and citywide events like the US 12 Heritage Route Annual Garage Sale benefits the local community and their residents by giving them something to participate in, either by hosting a sale, shopping at a sale or having new customers come by and check out their local businesses. Man, I went there and bought a lot of neat stuff. Great day. Damn, all the things there were such antique and really eye catchy, the visiting was a great experience thanks for the amazing article. keep it up.